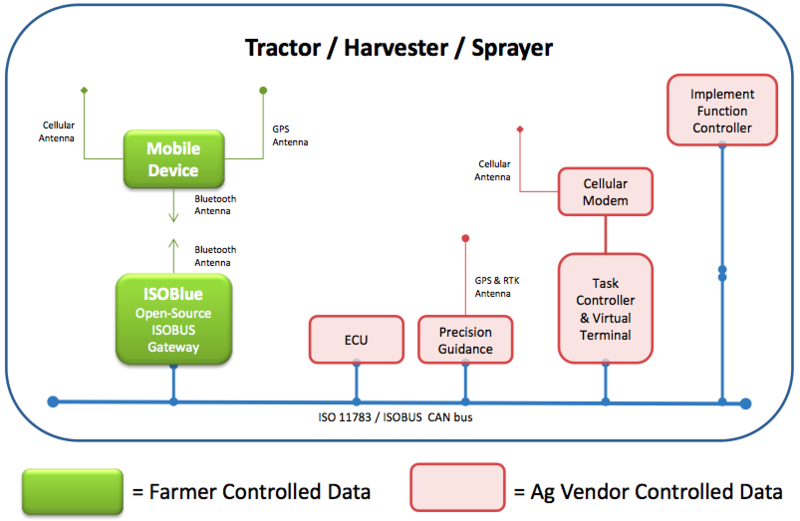 Many pieces of equipment used on modern farming operations share a standardized communications bus, known as an ISO11783 bus, or ISOBUS. It is a standard CAN communications bus operating at 250 kbps. The ISO11783 protocol specifies application-layer packet structures which are sent via the CAN Link and Physical layers. Currently, farmers, researchers, entreprenuers, and just about everyone else cannot easily access the massive amounts of mineable data that are generated by tractors, the implements they pull, and sensors in agriculture. This is due largely to overly proprietary data collection systems provided by tractor manufacturers. Since these systems on modern tractors generally communicate via a standard ISOBUS architecture, our goal is to free the data by forwarding it straight off the bus wirelessly to devices capable of doing useful things with it. Check out isoblue.org for documentation and the ISOBlue mailing list.